I was tickled today to notice that the Portland Deschutes Pub now has a 0.5 liter fill line -- 16.9 ounces -- on their Irish-style pint glasses. Not only that, but their skinny half-serving glasses have a 0.3 l marker, and their tulip-shaped snifters have a line at 0.4 l. Admittedly, it's been a few weeks since I've been to the pub, but this seems like a new development. 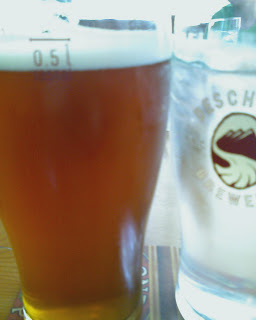 Thank you, Deschutes! You join the elite ranks of Belmont Station (0.5 l marker), Hopworks (0.4 l marker), and Brewers Union (20 oz. marker) who have a fill line marked on their glassware. Anyone else out there? The criteria for certification is simple: the pub must serve at least 16 fluid ounces for beers it labels “pints.” If the glass holds more than 16 ounces, fantastic. For certification, though, it must serve at least 16 ounces. You have to confirm this by measuring. I get Jeff's honest pint point: if it's called a "pint", it should be 16 ounces. But that scheme goes too far, and not far enough. What I mean is, you'll rarely get 16 ounces of beer in a serving at Hopworks, but you'll know that you got at least 0.4 liters (13.5 ounces) if the beer is up to the fill line. On the other hand, a place might get certified by the HPP based on a picture of one instance of 16 ounces of beer, but how can you know how much you got in the glass you just ordered? (5) Sell, offer or expose for sale, less than the quantity the person represents of any commodity, thing or service. Kudos to Deschutes for their new transparency. Support your local pub, and support the Honest Pint Project. I was tickled today to notice that the Portland Deschutes Pub now has a 0.5 liter fill line -- 16.9 ounces -- on their Irish-style pint glasses. Good find! Although there are no grades of honesty, I have tried to highlight those pubs offering honest pints that have lines. That's the gold standard for transparency. What I mean is, you'll rarely get 16 ounces of beer in a serving at Hopworks, but you'll know that you got at least 0.4 liters (13.5 ounces) if the beer is up to the fill line. On the other hand, a place might get certified by the HPP based on a picture of one instance of 16 ounces of beer, but how can you know how much you got in the glass you just ordered? No solution is perfect. If we demanded that pubs use glassware that have an accurate line indicating volume--the gold standard, clearly the preferable solution--very few pubs could qualify. That solution is elegant, but not much use to patrons who, 98% of the time, would find themselves in pubs we ignore. And that would be the case even in pubs serving honest pints. All solutions have downsides. Ideally, the HPP won't be a final solution. It's a stepping stone to the gold standard Deschutes, Belmont Station, and a couple others use--honest pints in clearly marked glassware. You have to start somewhere, and I hope the HPP's starting place is useful, even if imperfect. Jeff: I hope my love for the HPP shines through, despite my one minor quibble. You had to make a choice, and you chose slightly differently than I would have, but your choice is still good. No, quibbles are cool. The worry would be if people weren't engaging it at all. Engaging and quibbling I heartily welcome. And, of course, such quibbles invite discussion, which I can rarely resist. You should take this concept to Paris where barowners seen to think a pint(implied a brittish pint,since most europeans are unaware there is such thing as an american pint)is half a liter.